No other storage space was available at that point according to staff. Needless to say, this removed most of the legroom the respective passengers had (depending on shoe size, maybe forcing them to invade their neighbour's legroom), made the part of the legroom below the seat in front of them inaccessible, and (probably most importantly) also made accessing the life vest impossible. This made me wonder: At this stage of boarding, i.e. all passengers have left the terminal, most are in the cabin, or the doors have even already been closed - is there anything that can be done about hand-luggage for which no space is left? Please note that I do not consider this a list question. I expect there to be either a very small set of options that would generally apply, or just the statement that it entirely depends on the airline, location, etc. (which would be a valuable answer in itself, too). As a last detail, the plane was a smaller passenger plane, maybe an Airbus 319 or similar. Larger planes might offer more leeway for stowing away things. 1: Roughly like the ones shown in that other question. EDIT: Seeing some of the answers/comments so far, please do note that I am not asking about the legality of the luggage storing solution that I observed. I am explicitly asking about realistic short-term alternatives when chances are you end up with your carry-on luggage, but without any cabin space for it. Pre-boarding; if the flight is full - people are asked to volunteer bags to be checked-in at the gate. Pre-boarding; if the flight is full - the gate agent will come around and simply tag people's luggage for gate checking. If the cabin is full - crew usually will fit luggage in a different class overhead space (if applicable, usually happens in larger aircraft, but I have seen this on a 737 where the business class rows had reserved overhead bin space). For example, if economy gets full, cabin crew will stow luggage in the business class overhead bins. If all overhead bins are full, and the luggage will not fit under the seat - then it must be stowed as per regulations before takeoff. I have seen on a very full (summertime) flight were after everyone was boarded there were still people standing around with their carry-ons and then the ground crew were brought on board to offload the luggage into the cargo hold. This caused a lovely 45 minute delay as all the bags had to be tagged. I have honestly, never seen what you have described in the graphic above. Not only is this against the rules (luggage must fit completely under the seat in front, or the overhead bins - it cannot prevent egress in case of emergency evacuation); but "storing" luggage like that does not prevent it from flying around in case of turbulence - ignoring the fact that legroom is pretty much gone and you are going to get very comfortable with your seatmate. I am actually quite surprised at this and curious to know more details on the airline (was it commercial or private charter?) and the duration of the flight. I am not sure, but perhaps rules are different for private charter vs. commercial airlines. I think you may have misinterpreted the situation or mis-judged the size of the other passengers items. 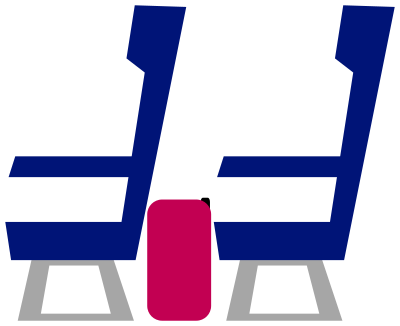 Stowing items under the seat in from of you is allowed and encouraged, so longs as it fits completely under the seat. Your legroom is not really a factor. The only time this would not be permitted is if the item extend out so far as to block egress during an evacuation. Regardless of the size of aircraft, there is no 'leeway'. The crew should verify all items are under the seat before the aircraft can move. If there is indeed no room, any item you have that does not fit under the seat in front of you must be checked or you must deboard the aircraft with all of your belongings. No airline will intentionally send gate checked baggage on another flight. They will offload cargo first, but, for clarity, that never happens. If in the seat wells the airline will be breaching regulations for which it can be in very serious trouble, so is not likely to resort to that solution at all often. Appropiate way to safely transportate heavy laptop during flight? What is the biggest hard-shell hand luggage model (by usable volume) that fits Ryanair's official limits and is sold in Europe?